Our latest area rug winners are from Indianapolis and were selected via the email newsletter list. Congratulations to the Kaiser Family! 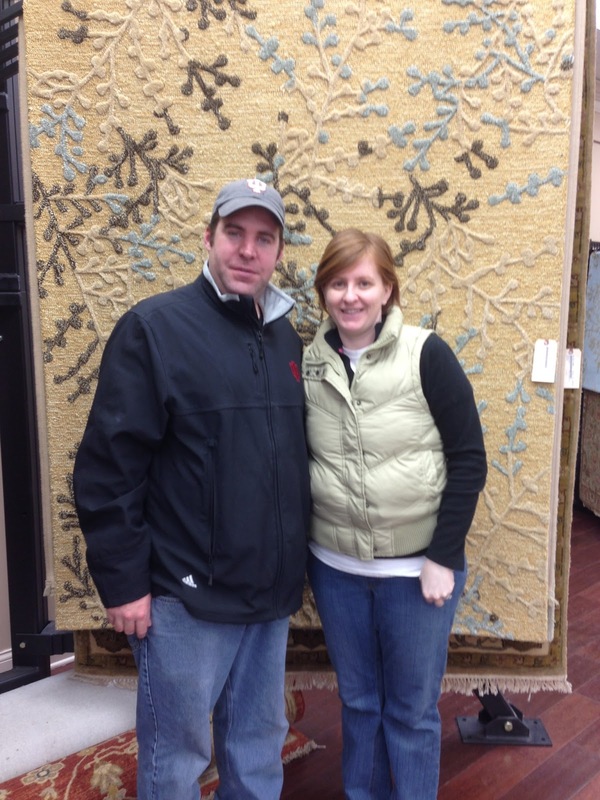 Mr. and Mrs. Kaiser from Indianapolis selected this classic area rug with neutral colors. The Kaisers were selected from our email newsletter list. We are excited each month to meet the winner(s) of our "Rug-A-Month" giveaway. It is hard to believe we have been giving away rugs since 2011 which means more than 24 beautiful area rugs have been awarded. If you want to be a winner too, it is easy. Sign up for our email newsletter (monthly tips and sales) or LIKE us on Facebook and be sure to type WIN on our wall with your email address. A new winner is selected at the end of each month and will be notified by email or phone call. We hope to see you join both networks and double your chances to win. We carry some of the best area rug manufacturers. If you are looking for something more unique, let our craftsmen create a one of a kind rug just for you! Our process includes it all, from design to cut, bind, serge and shape regular carpet into a custom rug made exclusively for you. We have 88 years of experience with rugs and can make your vision into a rug reality.